Life has taught me the wisdom of moving toward what scares me. Although it is embarrassing and painful, it is very healing to stop hiding from yourself. It is healing to know all the ways that you’re sneaky, all the ways that you hide out, all the ways that you shut down, deny, close off, criticize people, all your weird little ways. You can know all of that with some sense of humor and kindness. By knowing yourself, you’re coming to know humanness altogether. We are all up against these things. We are all in this together. Welcome the present moment as if you had invited it. It is all we ever have so we might as well work with it rather than struggling against it. We might as well make it our friend and teacher rather than our enemy. We work on ourselves, in order to help others, but we also help others, in order to work on ourselves. If one wishes suffering not to happen to the people and the earth, it begins with a kind heart. 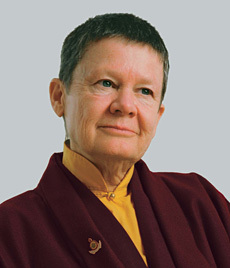 Most of these quotes are from the official Pema Chodron Foundation site, so I guess they’re her own synthesis of her teachings. In any moment you could just listen. In any moment, you could put your full attention on the immediacy of your experience. The unanswerable questions of our lives are the greatest teachers. Compassionate action involves working with ourselves as much as working with others. May I use words wisely to speak life into those around me today, to be a source of encouragement rather than discouragement, and hope rather than hurt, and of love rather than pain.